Classic texts that define the disjunctivist theory of perception. A central debate in contemporary philosophy of perception concerns the disjunctive theory of perceptual experience. Until the 1960s, philosophers of perception generally assumed that a veridical perception (a perceptual experience that presents the world as it really is) and a subjectively similar hallucination must have significant mental commonalities. Disjunctivists challenge this assumption, contending that the veridical perception and the corresponding hallucination share no mental core. Suppose that while you are looking at a lemon, God suddenly removes it, while keeping your brain activity constant. Although you notice no change, disjunctivists argue that the preremoval and postremoval experiences are radically different. 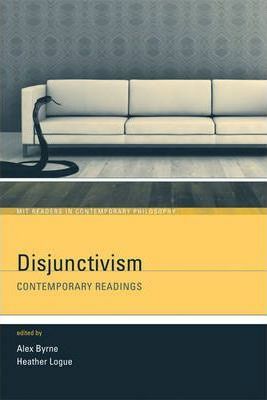 Disjunctivism has gained prominent supporters in recent years, as well as attracting much criticism. This reader collects for the first time in one volume classic texts that define and react to disjunctivism. These include an excerpt from a book by the late J. M. Hinton, who was the first to propose an explicitly disjunctivist position, and papers stating a number of important objections. [Disjunctivism], a reprinting of some of the most important articles on disjunctivism, shows how the history of disjunctivism developed. Alex Byrne is Professor of Philosophy at MIT and the coeditor of Fact and Value: Essays on Ethics and Metaphysics for Judith Jarvis Thomson (2001) and Readings on Color, volumes 1 and 2 (1997), all published by the MIT Press. Heather Logue is a graduate student in Philosophy at MIT. Harold Langsam is Professor of Philosophy at the University of Virginia. Mark Johnston is Professor and Chair of the Department of Biochemistry and Molecular Genetics at the University of Colorado School of Medicine and Editor-in-Chief of the journal Genetics.